The owners of Rouvus Drakensberger Stud near Ventersburg take performance testing and animal recording seriously. Father and son team Gawie and Frik Roux incorporated central growth testing into the management of their stud to determine feed conversion ratios (FCR), in conjunction with animal scientist, Danie Bosman. Gawie Roux started the Rouvus Drakensberger Stud in 1968. Despite the beef cattle industry being aware that effective use of animal feed is a primary determinant of profitability, cattle breeders continue to emphasise growth and muscling in the selection process, according to pioneer SA animal scientist, Danie Bosman. This has perpetuated the belief that due to the high correlation of 0,7 between post weaning growth and feed conversion ratio (FCR), the average daily gain (ADG) will improve FCR. FCR is a measure of the feed required in kilograms to produce 1kg of beef (dressed carcass weight). “A bull with a high ADG doesn’t necessarily present a good FCR. Breeders will therefore be well advised to measure both ADG and FCR. Stud breeders have the opportunity to markedly improve profit margins in the beef cattle industry by supplying genetically improved animals with top FCRs,” Danie explains. The poultry and pork production sectors have succeeded in genetically increasing FCRs, resulting in improved profitability, he says. The pork FCR has been increased from 3.1.1 to 2.0.1 over the past 15 years. Given the sharp hike in the price of animal feed, it is unlikely that either of these industries would have survived financially without improved FCRs. The SA poultry industry currently uses about four million tons of feed annually. “Should the industry have continued with an FCR of, say, 3.1.1, at least six million tons of feed would be needed. This constitutes a 33% increase in input costs,” he says. It is impossible for the beef cattle industry to produce animals profitably either in feedlots or on veld without FCRs, Danie stresses. The top-performing beef bulls tested at ARC’s facilities present an average FCR of 4,25 and ADG of 1 962g over a period of nine years (1999 to 2007). “The best individual FCR was 3, 79 with an ADG of 2 680g. A total of 435 Drakensberger bulls were tested at the Rouvus Drakensberger Stud’s test facility near Ventersburg over the past decade. The average FCR was 5.0.1 with an exceptional individual best of 3.2.1. The poorest performers presented an average FCR of 7.5.1 with an individual worst of 8.9.1. This clearly underscores the importance of Phase C Testing,” Danie explains. There are a number of reasons that FCR measurement is a vital part of beef cattle breeding, he says. Approximately 55% of the input costs needed to maintain a cow herd with an 80% calving percentage consist of feed costs. Improved FCRs will therefore markedly contribute to a cow herd’s profitability. Animal feed also constitutes about 70% of feedlot input costs. FCRs are therefore closely linked to the profitability of this industry, and have a considerably bigger impact on profit margins than ADG. Given the fact that feedlots are the most important buyer of weaners in South Africa, it is stud breeders’ responsibility to provide the commercial beef breeding industry with bulls that have top FCRs. A hundred cows each weighing 500kg and consuming about 2,5% of its body weight in feed daily consumes a total of 456t of feed per year. If each cow consumes 1kg less feed per day, a farmer will need 36,5t less animal feed per day. 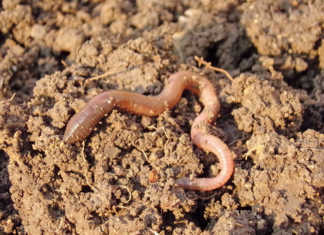 It was also established that the digestion of organic material already in the rumen was determined genetically. It was an inherited trait with a heritability of 0,34. This proved that the flow of food through the digestive tract differed between various animals in feedlots and those that are veld-reared. “The Rouvus Drakensberger bulls showed an interesting correlation of -0,50 between FCRs and body length. Longer-length bulls consequently presented better FCRs than shorter bulls,” Danie says. This conclusion was confirmed by the US Leachman Cattle Company that increasingly selects longer-length bulls. The company consists of 32 breeders with a total of 7 000 cows. Approximately 1 350 bulls are tested annually at the company’s testing facility in Colorado. According to Danie, the 2013 results of the growth test conducted at Gawie and Frik’s Rouvus testing facility were used to determine the impact of ADG and FCR on profit. This was based on the premise that bulls would have been sent for slaughter at the end of the test series. The results were calculated based on a weaner price of R20/kg, a 58% slaughtering percentage, a R34/kg selling price, and a feed price of R2,75/ kg. It was found, however, that bulls with the best FCRs were not the best growers and their FCRs were close to, or higher than 5.0.1. The results further indicated that well-muscled bulls tended to have poor FCRs (Table 1). Growth tests provide vital information for both stud bull breeders and buyers. Technology has made it possible for breeders to conduct on-farm growth tests to determine FCRs, as top genetics are vital in today’s market to ensure long-term sustainable and profitable beef cattle production. Genomic developments also afford breeders the opportunity to increase the accuracy of breeding values such as FCRs. Breeders have much to gain from determining the full potential of a bull over an 84-day growth test which can then be used in the selection process. “The ADG heritability in intensive growth tests was between 0,50 to 0,69, while the FC heritability was between 0,30 and 0,35. Extensive growth tests’ heritability for ADG is 0,30 or lower, depending on growth rate,” Danie explains. It is clear from the correlation between the different values of the Rouvus bulls tested (Table 2) that the correlation between FCR and profit (0,76) was considerably higher than the correlation between ADG and profit (0,55). However, height correlated negatively with FCR and both correlations were in the low range. The high negative correlation between length and FCR (-0,50) is of interest and indicates an improved FCR in longer-length Drakensbergers. These bulls also showed improved ADG with a moderate positive correlation of 0,28. “FCR is, in economical terms, two to three times more important than ADG. An animal with a 2 000g ADG and an FCR of 7.5.1 is less profitable than one with a 1 500g ADG coupled with a FCR of 5.0.1. FCRs should therefore be considered as an important selection tool,” Danie explains. 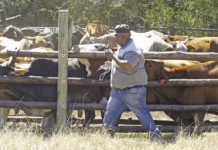 Gawie and Frik have been running a young bull growth test facility on their farm since 2007. Gawie explains that the Rouvus stud is managed according to precision farming principles. The latest technology makes it possible for stud breeders to determine an individual animal’s potential and performance in detail. “Of all the economic values in beef cattle production, I rate FCR as the most important,” says Gawie. Young bulls are subjected to an intensive growth test six weeks after weaning at seven months old. The test is conducted over 84 days and animals are fed the national intensive feeding ration. This includes 34% roughage and was specifically designed to ensure optimal growth. to an accumulative test centre average by breed, or if they are in a separate group of bulls, to the group average. The largest group ever is currently being tested and consists of 120 animals from the Rouxs’ own stud, as well as five other studs. “We measure growth, feed conversion and functional correctness,” Frik says. Animals are weighed every week and each day’s intake is carefully monitored. 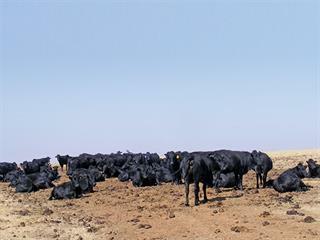 The data is forwarded to Bengufarm Beef for processing, a cattle management software company. At the end of the testing phase, the bulls are evaluated by SA Stud Book officials. Length, width, skin thickness, as well as subcutaneous fat and rib-eye area are evaluated. Those bulls that pass the growth test are then evaluated by the Drakensberger Cattle Breeders’ Society. Animals that do not perform to breed standards are slaughtered. 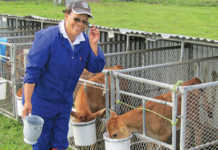 “The growth test costs about R4 500 per animal but it is money well spent,” Frik says. Bulls with an excellent FCR may be used on heifers as young as 15 months, which helps to improve a herd’s genetics at a faster rate. A 1kg improvement in feed consumed per animal born from these matings could lead to a substantial saving in grazing or feed. If two bulls with good FCRs produce 15 female progeny retained in the herd in the first year and the progeny consume 1kg less grazing per day it could save 5,5t of grazing in one year. 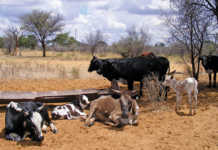 At R2/kg hay it amounts to an annual saving of R11 000 for these 15 animals alone. For 100 animals it would be R73 333 per annum. The efficient utilisation of grazing would increase as more progeny of tested bulls with favourable FCRs are added to the herd. “We can determine the most efficient genetics to be used and make it available to the beef cattle production industry as a whole. This is an important part of beef cattle precision farming,” Gawie says. Phone Gawie Roux on 083 264 5487, Frik Roux on 083 455 1264, or Danie Bosman on 083 637 0189.